The rolling bandwagon of automated corporate bond trading: Algos oust traders — Bondlinc: Digitalizing Bond Trading. Bond trading is undergoing a quiet, but fundamental change: The automation of smaller-sized bond trades. Certainly, we are in the early days of this analogue-to-digital conversion, but the effects on the microstructure of bond markets are likely meaningful – especially with respect to the costs of execution. If you think smaller trades are not relevant in corporate bond trading: 90 percent of all trades are worth less than $ 1 million. In this blog post, I elaborate on how and why banks are starting to replace dealers with machines and describe why this is fertile ground for new electronic trading platforms. Finally, I propose a hypothesis on how trading costs may evolve in the future. Back in August 2017, the Financial Times announced that Goldman Sachs has quietly started a program allowing to trade corporate bonds on a fully automated basis. The investment bank allows investors to trade corporate bonds without ever talking or dealing with a trader. The program is called Goldman Sachs Algorithm (GSA) and quotes prices in about 7’000 securities, with quotes being immediately executable– for instance via Bloomberg. This stands in stark contrast to the traditional bond pricing method where banks and brokers show only indicative prices. This means that investors are always required to manually send request-for-quotes (RFQs) to a trader, who then decides about the offering price. Prices offered by GSA are dynamic, respond automatically to changes in market conditions, and are therefore live and firm. Although Goldman Sachs currently limits the GSA’s offering only to smaller-sized trades (so-called “oddlots” or trades worth less than $ 1 million), the investment bank will potentially broaden its automated trading business in trade size and security quantity over time. Another bank that is ready to jump on the rolling bandwagon of automated corporate bond trading is UBS. In March 2018, Bloomberg announced that UBS has introduced algorithms to price trade requests from investors automatically. The bank’s algo is able to tap into a pool of trading and market data in order to calculate and price bonds automatically and without human interaction. Like Goldman Sachs, UBS has started automated corporate bond trading for smaller-sized trades but ultimately aims to build a system that is able to manage its own trading book. But in order to reach that stage, technology needs to further mature. Another sign that the train of automated corporate bond trading is gathering significant speed is the number of trades executed by algos on MarketAxess – the largest electronic trading platform in the US. The number of banks that answer on trade requests via algos has increased from four to eight; responses from algos on trading requests have surged from 400’000 (4Q2017) to 653’000 (1Q2018). Certainly still a small, but dynamically increasing number. This analogue-to-digital conversation in corporate bond trading is decisively fostered by the pressure for banks to cut costs and to allocate more resources for dealers to execute larger, more lucrative trades. Another driver is the growing adoption of electronic trading that enables the digitisation of trading data. Since the turn of the 21st century, we have observed a major shift from voice-based trading to more electronic trading. Trading information is becoming more and more transparent – facilitated by increased transparency initiatives and regulatory requirements – and the digital trace from market participants and their trading activities can be tracked more seamlessly. This includes the digital recording of trading data, as well as the market participants’ stated axes, indications of interests and other relevant market data. This trading data – which was not available a couple of years ago – can be used as an input variable for pricing bonds. The availability of relevant data is a crucial prerequisite for automated trading. The rise of automated corporate bond trading has already brought up new trading platforms that are built upon fully automated trading processes. An example is Saxo Bank’s Digital Bond Offering. The platform eliminates manual processes and gives (retail) investors direct access to a universe of over 5’000 bonds. Orders are routed electronically and straight to an automated dealer auction. Trades are typically executed within seconds, as algos answer almost instantly to trading requests. However, what is the potential effect on the costs of transacting corporate bonds if smaller-sized trades are more and more frequently executed automatically by machines? 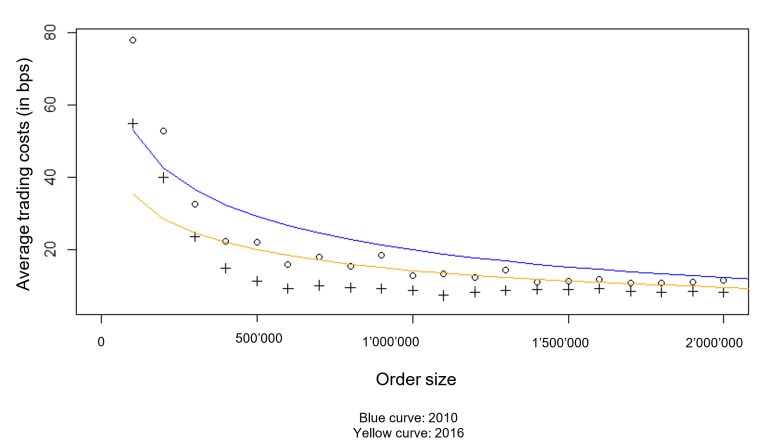 The basis for my hypothesis is based on the graph below: The chart shows the costs for transacting bonds in basis points (y-axis), dependent on the order size (x-axis) in 2016 (yellow line) versus 2010 (blue). On the one hand, one can see that the transaction costs for bonds have greatly decreased since 2010. For instance, the average trading costs for corporate bond trades worth less than $ 100’000 amounted to 80 basis points (=0.8 percent) in 2010; these costs decreased by almost one third to 55 basis points (=0.55 percent) in 2016. On the other hand, there is strong evidence that the costs for trading corporate bonds tend to decrease regressively with trading size. As a result, investors pay (far) higher transaction costs for smaller trades than for larger ones. My hypothesis is that the automation of smaller-sized trades lead to the reshaping of the cost curve. I assume that we will see a flattening of the cost curve and that the shape of the curve will change into a more linear form over time. This is based on the assumption that banks price automated trading in a more linear way (as equities) which would result in a flatter, more linear cost function. As a result, investors will receive a better price experience for small-order trades and banks can offer these trades at lower costs (through a higher degree of automation).